Over 15,000 letters from concerned individuals from around the world crying out for the cessation of the costly and devastating Bureau of Land Management‘s (BLM) relentless roundups of federally protected American wild horses and burros reached the desk of President Obama during the first week of October thanks to the facilitation of Virginia’s Congressman Jim Moran and equine advocacy groups, Wild Horse Freedom Federation (WHFF), Habitat for Horses (HfH) and The Cloud Foundation (TCF) and many others. Originally born as a personal appeal from co-founders of WHFF Terry and R.T. Fitch the call to action spread like wildfire and in a matter of days manifested into an international written appeal to call for a moratorium on the deadly roundups so that an appropriate accounting could take place of both how many wild equids are left on their rightful range and how many are ‘actually’ in long and short term holding. Terry and R.T. pledged to personally fly the letters to D.C., at their own expense, while the office of Rep. Jim Moran offered to facilitate the delivery to the White House. 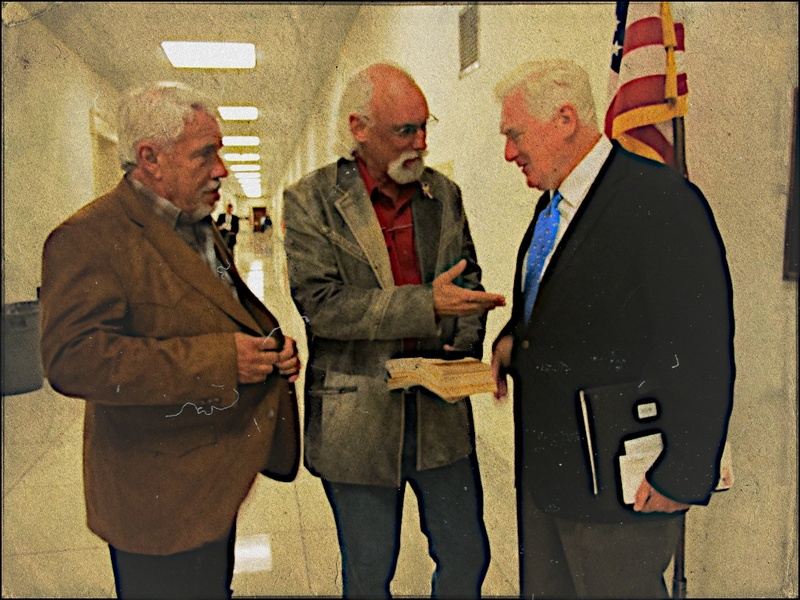 On September 13th, Terry, R.T. and Jerry Finch, founder and president of Habitat for Horses, flew from their Texas homes to meet with Rep. Moran, in Washington D.C., and to deliver the letters written by thousands of impassioned American voters and concerned international advocates. The office of Rep. Moran has delivered the letters to the President and the Congressman reinforced the plea for sanity with a cover letter which is inserted below. The letter mentions only R.T. Fitch from whence the concept was born but WHFF, HfH, TCF, EWA, dozens of other organizations and thousands of concerned individuals from around the globe reached out to make this happen. GREAT!!! We shall see what President Obama does with this!!!! Forever grateful to Rep. Jim Moran. Hoping and praying these letters will stop the unnecessary roundups. There are now about 51,000 wild horses in holding or are supposed to be. Also there are only approximately 15,000 probably still free on government lands. 12,000 are to be removed. This is extinction. You are so right Barbara. First, thanks to you R.T., Terry, Jerry, and to Congressman Moran. Now we just have to wait on a letter of acknowledgement that the President has at last received our letters and is aware of our concerns. Last night was the first night in three and 1/2 years I heard the President uses the words horses in his now famous quip that “there are fewer horses and bayonets now…” Apparently the President is unaware that marines continue to use bayonettes as well as horses and mules. These missions are classified or at least not publicized, but I know that the training is still ongoing for soldiers at bases in this state. This part of the debate was played over and over again, until all I could here was the President saying “There are fewer horses…” And his policies are the reason why. First of all, he put Ken Salazar in charge or Interior, and the Secretary and the President of the Senate have worked together to get as many horses as they can off the land, and then shuffle the ones not adopted to slaughter. As for domestic horses, his fuel prices are high enough to significantly increase the price of hay during a two year period where we have had massive drought and devestaging wild fires. Market forces are at play, so the less there is of a commodity when there is a demand, the higher the price. Meanwhile, pastures of hay are now full of government subsidized corn. The increase in fuel prices and the drought are increasing the price of horse feed, and USDA contracts with China means that even if Americans need hay for their horses, the hay has already been sold to China. I understand that the farmers have the right to sell it to the highest bidder, but it seems like Americans should help Americans first. Of course, agriculture is our best export area now. We need to get one of our members of Congress of perhaps petition the USDA to take some of the conservation acreage they have to grow horse quality hay. Even though we do not raise horses for food, a lot of people earn their living through providing services for horses. More middle class families ($80,000—$150,000) own families than any other socio-economic group. It would be most unfortunate if our environmental and energy policies had the consequence of limiting resources for horses to the point where ordinary people could not enjoy the pleasure of having equines in their lives. Not defending “policies” here but last time I checked the President doesn’t determine fuel prices. Interestingly just today Breitbart blogged about current military use of horses. Yes, special forces do blend in on horseback and still have to be trained to do so. Obama said there are less horses used and less bayonets – that’s the key. To think how many millions died for the old man inspired wars that young men had to fight, it’s consoling to know that relatively a much smaller number of horses are used today for those violent purposes. My father rode a stallion in WWII while he also controlled the mare pulling the gun carriage. How he did that I don’t know, but he loved them both. From what I have seen almost none of our elected officials act on the will of the people because they are to busy doing the will of their corporate masters. The population number in holding was @ 49K earlier this year, yesterday I saw a figure of 41K, thousands are unaccounted for – vanished. blm consistently uses a figure of 38K left in the wild – this figure never changes year after year. Like Barbara and many others, I believe this figure is grossly exaggerated and they are very near extinction. I believe fertility control on an endangered species is ludacris, dangerous, and fiscally irresponsible. And somebody’s head should roll over this fiasco. It’s so terrific that the petitions have reached the WH. Thank you RT, Jerry, EWA and everyone who worked so hard on this project. Our emotions often run the gamut from near despair to numbness to anger because of how our heritage equines are treated. But successes like these buoy up feelings with the realization that there might be hope in bringing this fight to its right conclusion — that our equines will live on the range they have every right to, because this is where they are from and where they originally evolved. Awesome. Thank you RT, Habitat for Horses, and the Cloud Foundation for the idea and for delivering these letter. Also thank you to Congressman Moran for finding a way to make certain they got to Obama’s desk. And a huge thank you to everyone of these 15,000 people who took the time to join in and put their plea for our horses to paper. Now we KNOW the president is aware of our concerns. I will be watching to see if anything is done with this information. Hopefully, he pulls out some letters and personally reads them. Just think, the tax payers are paying nearly a million dollars per year, per horse in short and long term holding and no-one at the BLM questions where that money is going. Can you imagine the wonderful kind of home for even half that amount of money. At the Central Valley slaughterhouse, downed cows are kicked, beaten in order to have them upright for slaughter and therefore saleable. While the FBI and Republicans in the House and Senate jammed the Animal Enterprise Terrorism Act through Congress, wanting to protect actual terrorist butchers of animals from those working to protect animals, a new video of a California slaughterhouse, the Central Valley Meat Co. of Hanford, filmed by Compassion Over Killing, has caused the shutdown of the facility because the animals are obviously sick. In order to be able to slaughter them while they are alive (and therefore saleable), the workers kick, punch and beat them, as shown in the link below. It is not just animals but humans who are protected by exposure of slaughterhouse conditions. Animal rights activists are doing the job that the FDA, USDA, NIH and the CDC have neglected. Romney invested Bain Capital in many animal torture facilities. These videos will encourage anyone to go the vegan route and be healthier for it. What animal torture facilities did Bain invest in? Thank You and God Bless ALL involved !! You surely will be rewarded in Eternity and hopefully and prayerfully a more “Caring” WH in months and/or years ahead , for our precious Wild ones. As for Mr. Obama to be the better of the 2 candidates to deal with, concerning our horse issues .. I respectfully disagree for far too many reasons to state here ..
PS.. November 7, 2006 — California Representative Nancy Pelosi and Nevada Senator Harry Reid lead the Democratic Party in taking control of both the House and the Senate in the 2006 congressional elections, the first time in 12 years the Democrats secure control of both houses of Congress simultaneously. God help us ALL if the current administration is given another 4 years !! Now we’ll see if Obama meant what he said when we voted him in. Thanks RT, Terri, Jerry, and Congressman Moran. Now we’ll see if Obama meant what he said when we voted him in. Thanks RT, Terri, Jerry, and Congressman Moran. And to all that wrote letters, signed petitions a great big ghanks!!! Thank you to ALL who spoke up for the Wild Horses and Burros. As many of you have done, I also have sat with them and heard their voice and must speak for them. 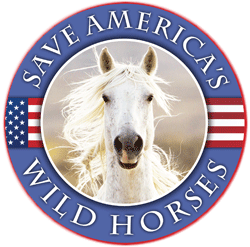 It’s about time, before we have no more Wild Horses!!! Thank you to all that brought about these letters going to the White House. 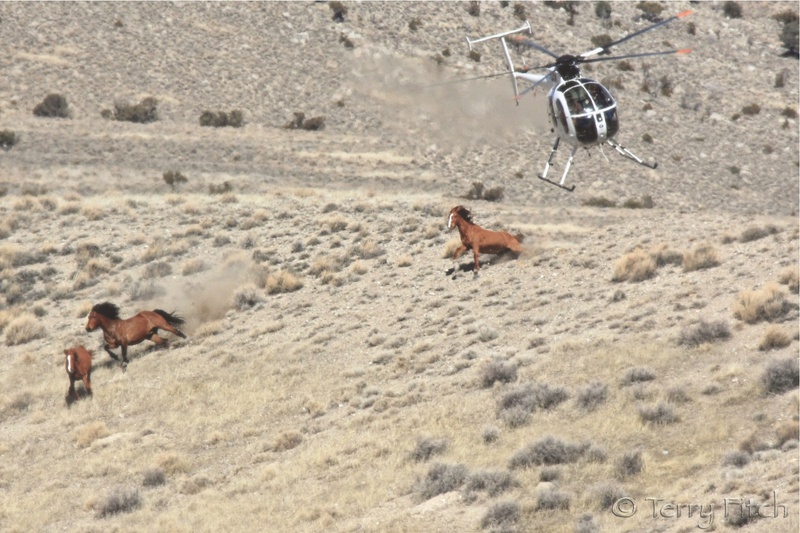 It’s about time that this travesty is corrected and all the wild horses and burros are returned to their rightful home range and no more helicopters will be chasing them. In addition, all the cattle need to be taken to their owners and if they have no more land for them, the owner will have to deal with the situation as he choses. These wild horses are majestic and should be America’s ICON. And, in addition, the bill should pass prohibiting the transport of our horses and donkeys, domestic or otherwise, from being taken across our borders. Why not make a large sanctary with some of the monies being spent now for the holding pens, and keep these domestic horses, etc. until new homes can be found, hopefully, with the future having a better economy and hopefully we can keep our hay instead of sending it to China and other countries. We need to help Americans FIRST and their companion animals. Let’s see that it happens. Again, God Bless all that had a hand in delivering these letters to the President. keep writing my Senators also and the only one who who has responded is the one up for re-election. I hate to say this but the letters were given to a staff member to process and if they are considered important enough to deliver to the President another staff member will decide. His “highness” is to busy trying to get himself reelected to have much interest in anything but that. This man has no interest in these horses nor the ones that are slaughtered or he would have at least looked into it in four years, keep in mind that I mailed his office a stack of information when he was first elected about what was happening at the slaughter plants along with a CD secretly taken at two of the slaughter plants in Canada Bouvry, Richelieu to no avail. You know that many more people besides me did the same thing I did about sending the information to the White House and heard nothing back and never will but that didn’t stop me from trying. 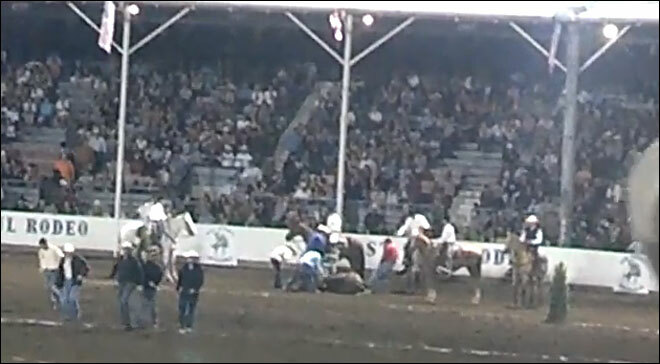 God is not going to help these horses we have too if that’s possible. That was my thoughts also, I just did not want to be a downer on this great thing that RT, Terry and Jerry did, and we all hoped would make a difference. Hope that they were not given to the staff aid in charge of shredding. Contact. What next? Thanks RT, Terry and Jerry and all the letter writers. Excellent!!!! This is a productive way to enlighten the president to the frustration and disgust over the treatment of our wild herds of Equines. The waste of the tax payees money, the negative image these types of unethical and wasteful manner of wasting taxpayers money. The president represents the people not the corporations the puppet the BLMs every move putting the wild herds, along with other animals, foliage, are water supply in jeparody. It’s time for this waste and corruption to end. Americans need to support each other bring Americaback to a place of pride and honor. They can begin doing this in Washingtion by restoring our trust not continuing to worship Greedy efforts the erode our society and destroy our beautiful country by putting it up for sale to the highest bidder. I am still impressed with how quickly the 15,000 letters were written & submitted. Can only imagine what it would be like if thousands of letters came through my printer! What a huge task yet such a good idea! Thanks so much! Not giving up hope! Sadly most Americans will stand by and allow the government and the BLM to slaughter and remove these American icons from their ranges. Follow the money… It is so the greedy cattlemen can rent BLM land for a few dollars a year and that way they don;t have to pay their own money to fatten their cows, and put more money in their fat wallets. What is next, the smelting of the Statue of Liberty! She too is an American icon, as are these wild horses from our past, they helped shape the west, their ancestors were part of the pony express, stage lines, and even calvery mounts. Time for the greed to stop, and let these horses live where they have for hundreds of years. Is truly a shame. Please be a voice for the horses who can’t speak for themselves. The people on the East Coast care about domestic horses because they see them either on the streets pulling carriages or racing or hear stories about truckloads being sent to Canada. We just have to keep on keeping on for our wild ones who are rightfully on the range.